I'm pretty sure I've used this paper and stamp combo before, but I loved how this set came out to end this weeks layout challenge. Its also a Festive Friday, so appropriate that we get a little merry! OK, maybe A LOT merry... I tried a few combinations of the stars and stamps! I cut the center strip thinner in today's cards than the other layouts this week for two reasons: I wanted the green paper with the tree pattern to show more, the pattern is widely scattered; and on a couple cards I used the silver foil pattern - which I would be stingy with, since it does only have 1 sheet in that design. "Good Paper" and all, LOL I'm sure some of you know what I mean! 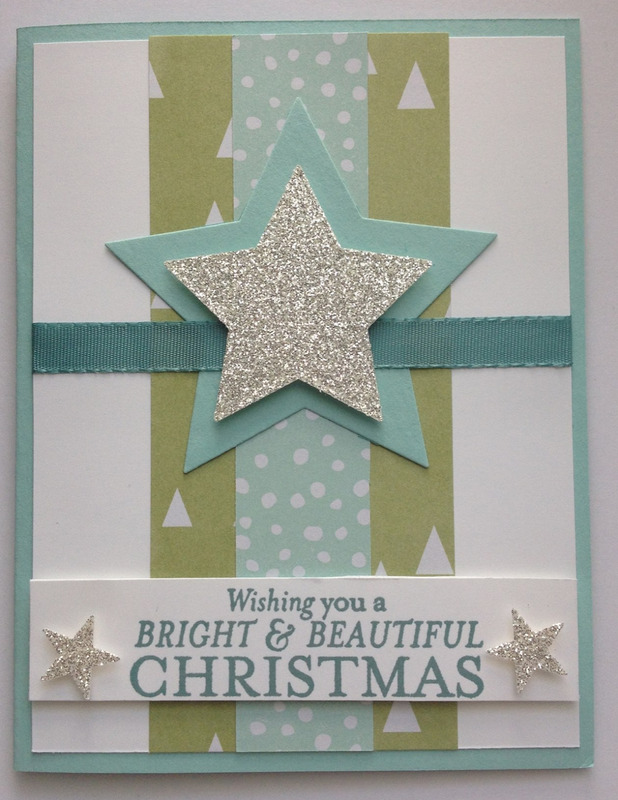 The card base is Pool Party, and the stars are Pool Party and Silver Glimmer Paper. 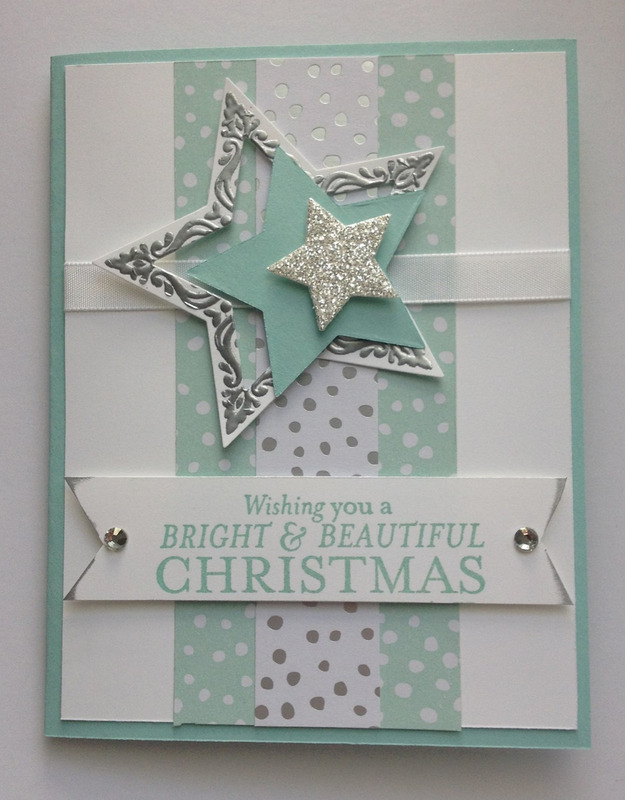 I used a darker accent ribbon in Lost Lagoon and matched the sentiment stamp in Lost Lagoon ink. The sentiment in the Bright and Beautiful set was a little large for my cards, so I trimmed off the part about New Years. This card has the Smokey Slate card base, with the silver foil pattern on the center panel. 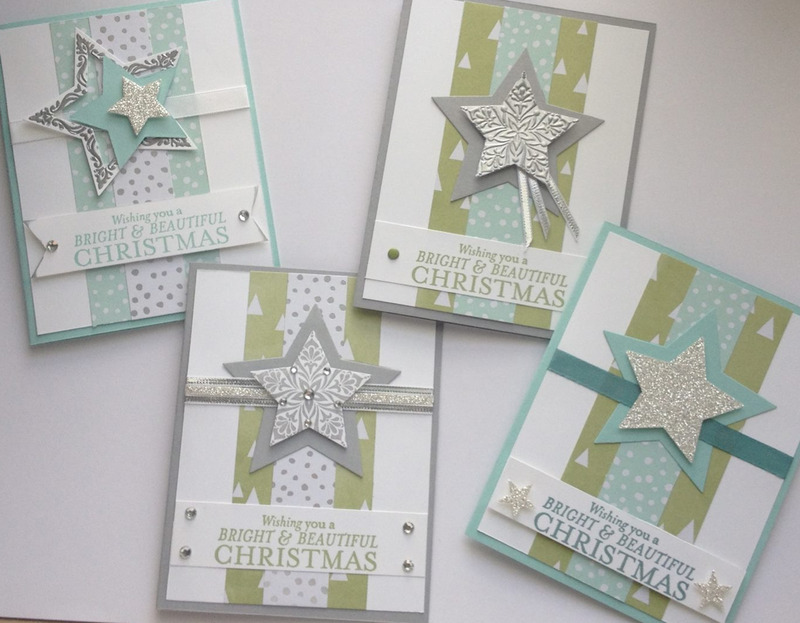 The star is stamped in the Metallic Silver ink, and the sentiment is stamped in Pear Pizazz. 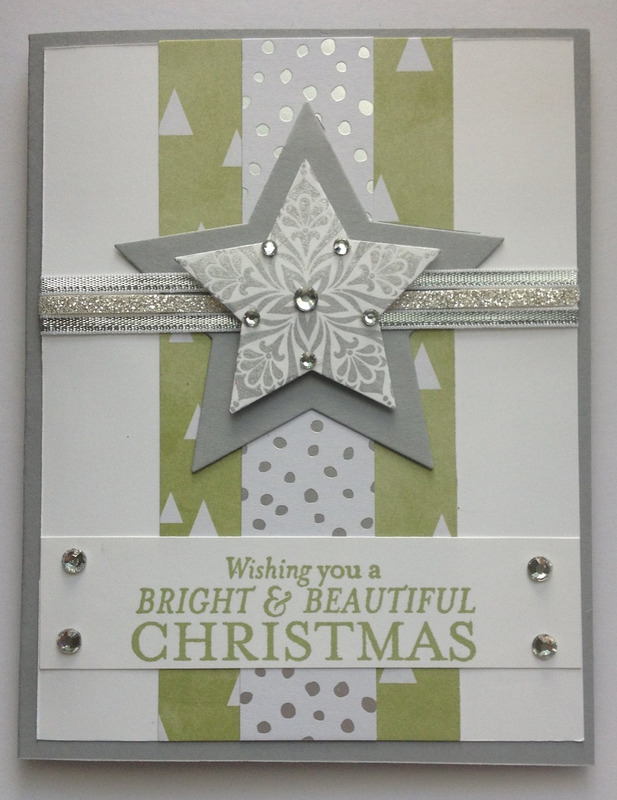 The "ribbon" accent is actually 3 parts, a sliver of the Silver Glimmer Paper, and two strips of Silver 1/8 Ribbon. This card has the Smokey Slate base and Pear Pizzazz sentiment, but the center star is heat embossed using the Silver embossing powder. 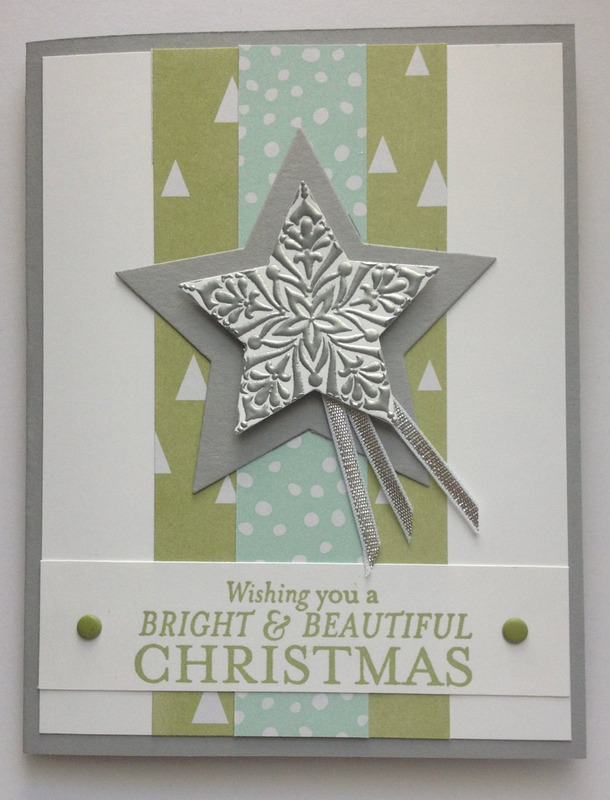 The ribbon accent was done differently, using the Silver 1/8 Ribbon tucked under one corner of the star. Candy Dots anchor the sentiment strip. Silver Embossing powder, Silver Glimmer Paper. This last card was not intended, but after I die cut the smaller star out of the larger embossed image I couldn't just *waste* it! So this last card was made. I used some white ribbon to thread through the center of the embossed star, and then layered a Pool Party card stock star, and a Silver Glimmer Paper star over the top. The edges of the sentiment banner are smudged in the Silver Metallic Encore Ink. May your weekend include a good amount of creative time!